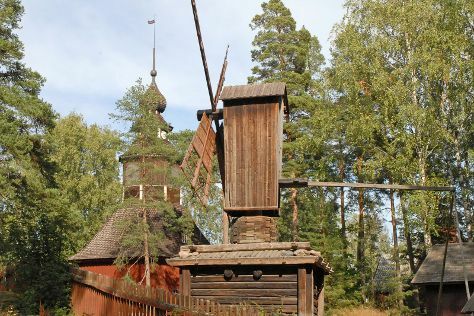 Get some historical perspective at Seurasaari Island and Open-Air Museum and Cathedral of Porvoo. Get a sense of the local culture at Sea Fortress Suomenlinna and Linden Esplanade. Explore the numerous day-trip ideas around Helsinki: Bellevue Beach (in Hanko), Teijo national park (in Pernio) and Arboretum Mustila (in Elimaki). Spend the 24th (Fri) exploring nature at Ekenas Archipelago National Park. Spend the 25th (Sat) exploring nature at Nuuksio National Park. There's much more to do: take in the architecture and atmosphere at Rock Church, explore the world behind art at Kansallisgalleria, identify plant and animal life at Laajalahti Nature Reserve, and steep yourself in history at Castle Hill. To see more things to do, other places to visit, reviews, and other tourist information, use the Helsinki trip planner . If you are flying in from United States, the closest major airport is Helsinki Vantaa Airport. In May, daily temperatures in Helsinki can reach 60°F, while at night they dip to 43°F. Finish your sightseeing early on the 25th (Sat) so you can travel back home.